Addolfo Davis received a mandatory life without parole sentence for a crime committed when he was 14 years old. In the summer of 2012, in a case called Miller v. Alabama, the U. S. Supreme Court ruled that mandatory life without parole sentences for juveniles are cruel and unusual punishment, and therefore unconstitutional. The key word here is “mandatory.” In the 1980s and 90s there was a lot of talk about young “super predators” and almost every state enacted tougher punishment for juveniles who committed violent crimes. Illinois was no exception. The Supreme Court said that mandatory sentences don’t let a judge consider extenuating circumstances such as the person’s age, home life, how involved he was in the crime, and the potential for rehabilitation. But the decision didn’t entirely rule out life without parole sentences for juveniles—though the Court said they should be used only sparingly. 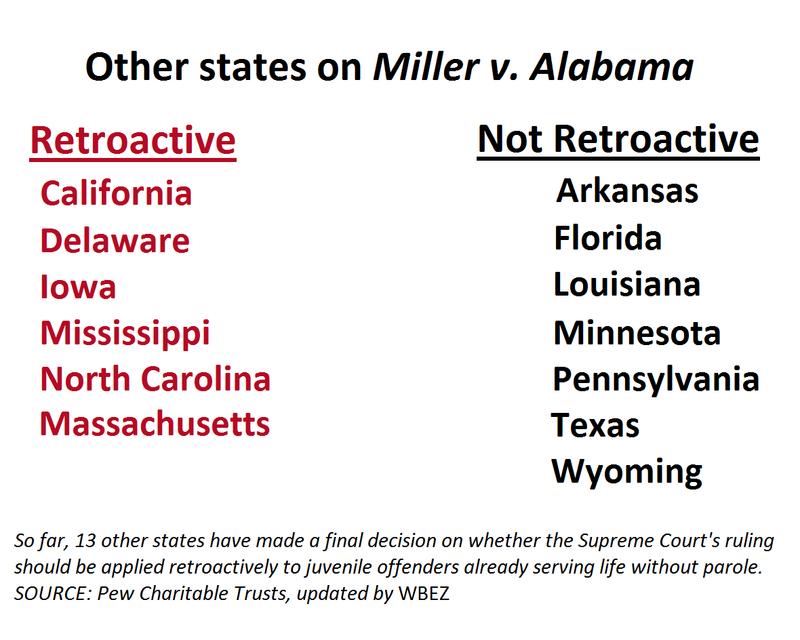 In its wake, Miller has raised a thorny legal question: Should it also apply to people in prison who as juveniles received mandatory life without parole sentences but now their appeals are over, and their case is closed? The question has come up because several such people have requested new sentencing hearings. And Illinois’s Appellate Court, citing the Miller decision, granted at least five of them – unanimously. One of those five people is Addolfo Davis. Davis was arrested two months past his 14th birthday and he’s never seen the streets since. Today he’s 37 and has spent almost two-thirds of his life behind bars. It’s Addolfo’s case that will be presented in oral arguments today, January 15, before the Illinois Supreme Court.Patricia Soung, who will represent Davis, tells WBEZ that on the night of his crime he went with two older co-defendants, at their instruction, to rob an apartment. “Two people were shot and killed that night by the two older co-defendants,“ she tells us. “Davis was convicted of double homicide as an accomplice,” she says, and ultimately received a mandatory life without parole sentence. The lawyers won’t just be arguing the facts of the Davis case this day. They’ll also debate whether Miller v. Alabama is so ground-breaking that it should apply to cases that are already settled. In her opinion Miller is so sweeping that it falls into both categories.But not everyone agrees. How exactly the court differentiates substantive from watershed is complex and open to interpretation. I’m not the only one who thinks these definitions can get murky. Matt Jones, associate director of the Illinois Office of the State’s Attorney, Appellate Prosecutor, thinks so too. Jones says the U.S Supreme Court almost never considers a new rule earth-shaking enough to actually do this. Counsel, that is, for defendants in criminal cases who couldn’t afford to pay for an attorney. That seems like a rather high bar. One that Miller doesn’t reach, according to many prosecutors across Illinois. I asked Patricia Soung if she’s worried that the Miller decision isn’t significant enough to meet that standard. Introducing the possibility of re-sentencing hearings for juvenile life without parole cases from long ago introduces a difficult problem. There could potentially be hundreds of victims and first-hand witnesses who’ve been assured that the perpetrators are imprisoned for life. These are gut-wrenching concerns, and so the Illinois Supreme Court will be venturing into complicated and emotional territory. Court watchers expect a decision by the summer. Clarification: While today’s oral arguments were pending, Cook County State’s Attorney Alan Spellberg declined WBEZ’s request for an interview. With permission from the Cook County State’s Attorney’s office, WBEZ used tape of Spellberg from an interview conducted in March of 2012 whrn we were preparing a story about Addolfo Davis’ bid for clemency.